We are certainly enjoying the warmer winter weather in Texas, and are happy we don’t have to deal with Indiana’s ice and snow with temperatures near or below freezing for three or four months in the winter. 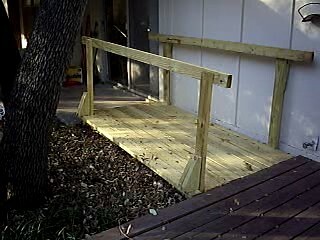 I built a little wooden bridge from the concrete slab patio just outside the back door to the large wooden deck just a few feet away, so Lea could do some pot gardening. She loves working in the soil, but can’t work in the ground any more. The deck also gives her a sense of independence because she can now go out on the deck whenever she wants to, without having to wait for me. I captured her on camera this afternoon, and asked her to tell about her garden. That video appears below. As we settle in, we have found a church that we are enjoying, and I have started some initial steps to get my consulting practice back up and running. I had to pretty much give it up entirely to care for Lea for the last couple of years, but now that she is getting better, I feel I can leave her alone for a few hours at a time, and would like to take on some advertising or marketing design, or maybe even some training design jobs. Again, I trust that He will open the doors according to His will. I just need to be ready to step through them. We just thank Him every day for the blessings of that day, and pray for His guidance in serving His will. Lea’s Pot Garden was a joy to watch and to be able to see she can manuver around without the walkerand her cane.Larry,I know that your heart smiles when you see her independence . God bless both of you this morning. It leaves a sweetness about me to hear how well she is doing. “Happy Anniversary”, Sorry I missed remembering. My congratulations is late but my Love hangs on and on and on> I am grateful that I can be here to say so. Hugs and kisses! Hallelujah! Good times are here again!